Welcome to Christ’s Lutheran Church! We hope that this website can offer you a small glimpse of our ministry; and that it can help you to better understand the joy we find in spreading the Good News of Jesus Christ as we share God’s amazing grace with our members, our community, and our world. We welcome you to learn more about our ministry and to explore new ways that you can do God’s work with your very own hands – whether you’re a life-long Christian or if you’re just beginning to more deeply explore spirituality and Christian living for the first time. 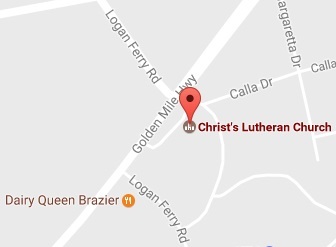 There’s always a place for you at Christ’s Lutheran Church; and we welcome you to learn more about our growing, Spirit-filled and welcoming community. We are committed: to extending God’s welcome and embrace to all people, to nurturing God’s people through Word and Sacrament, to promoting Christ-centered community and well-being, and to equipping and empowering God’s people for life and ministry. We look forward to meeting you; and we pray that you will continue to find strength, hope and joy in Christ Jesus in the days ahead! Our church now has our own App for your phone or tablet! Get access to sermons, news, the calendar and more! Bring up this webpage from your phone/tablet and click on one of the two icons below to get the new App and try it out.